In this volume, the author challenges a number of widely held cultural stereotypes about India. Caste is not as old as Indian civilization itself, and current changes are no more radical than in the past, for caste has evolved throughout its history. It is not a colonial invention, nor does it result from weak state control. There is no single form of Indian kingship, and power relations, fundamental as they are for understanding Indian society. Nor do Indian villages conform to a single type, and caste is as much urban as rural. Only in a regional ‘local’ perspective can we view it as a ‘system’. Caste does offer space for the individual, though in a particular Indian mould, and Hinduism does not provide for an integration of castes through ritual. In short, social organization varies widely in India, and cannot provide the key to the specificity of caste. This must be sought in the way society is imagined, the models of society current in Indian thought. Of course as mentioned above, there is no single model: Brahmins, kings, and merchants among others have all produced alternative models with themselves at the centre, vying for hegemony, while facing contesting models held by subalterns. Still, a hierarchical mode of thought is hegemonic and largely explains why Indians see their social stratification differently from people in the West. The volume will be indispensable for scholars of South Asian Sociology and Culture. Harald Tambs-Lyche studied at the University of Bergen, Norway and at SOAS, London. Following work on the Indian diaspora (London Patidars, 1980) he worked extensively on religion and society in Saurashtra, Gujarat (Power, Profit and Poetry, 1997; The Good Country, 2004). Since the 1990s he has worked on the Gauda Saraswat Brahmins of South Kanara (Business Brahmins, 2011), and is currently working, with his wife Marine Carrin, on a monograph on that region. 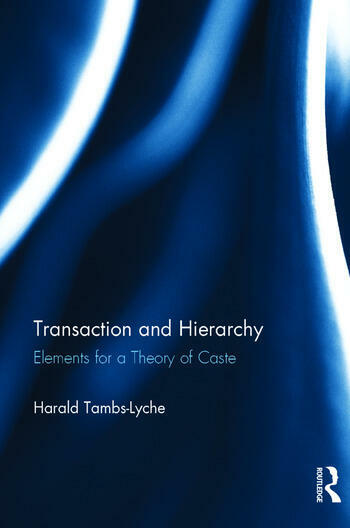 Tambs-Lyche has co-authored, edited or co-edited several other books, and is the author of a large number of papers on Indian religion and society. He retired as professor of Ethnology, University of Picardie at Amiens, France, in 2013.